Inc.; Liviu Marza, Associate Principal, ADD, Inc. The Carpenters Center has been recognized by the Construction Institute as a winner of their Pride in Construction Project of the Year award. Yesterday, The Construction Institute (TCI) presented the Pride in Construction Project of the Year Awards and the Volpe-Eagan Construction Safety Awards at their annual meeting and holiday luncheon. TCI awarded three Pride in Construction Project of the Year Awards recognizing The Carpenters Center (private sector project), the Fall River Justice Center (state public sector project) and the Haystack Ultra-Wideband Satellite Imaging Radar Antenna (federal public sector project). The Carpenters Center was recognized for being an adaptive re-use of the property, by renovating and converting the existing building, which was in a state of disrepair and an eyesore for the community, into an appropriately-designed, mixed-use building. The Carpenters Union worked very closely with the surrounding community members to ensure that the design of the building complimented the neighborhood? ?s architectural character. The building stands as a symbol of pride and tradition of the Carpenters Union and its membership. 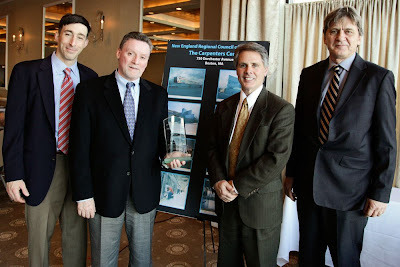 David Dow, NERCC Special Projects, accepted the award on the behalf of the Carpenters Union. Dow recognized and thanked the membership involved in the construction of the facility as well as the NERCC staff who ? ?had a vision and saw that vision through?? in the planning, design and execution of the project. He also acknowledged the project architecture firm ADD, Inc. and Construction Manager Suffolk Construction. Following the Project of the Year Awards, two individuals were recognized as recipients of the Volpe-Eagan Safety Award. 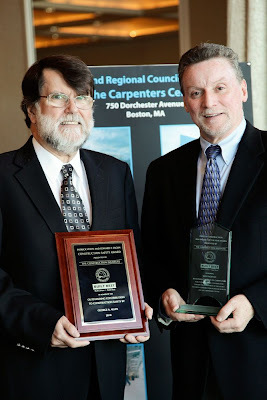 Receiving the safety awards were George Allen, Principal and Treasurer of signatory contractor Archer Corporation, and Trustee of the Boston Carpenters Apprenticeship and Training Fund and with Jamie Merloni, Training Director for the New England Laborers?? Training Trust Fund. behalf of the Carpenters Union. The safety awards are conferred in honor of Patrick Volpe and Edward F. Eagan, both pioneers in promoting health and safety in the construction industry. Volpe was Safety Director for Volpe Construction and Chairman of Bulletin 12, a former state committee charged with revising the Commonwealth's occupational safety and health regulations. Eagan was a member of IBEW Local 103, had over twenty years of service with the Occupational Safety and Health Administration and was highly regarded by both labor and management for his tireless dedication to safeguarding the lives and health of workers. Because of his outstanding contributions to safety and health in the construction industry, Eagan received the Volpe Safety Award in 1979. TCI has continued this tradition with the hope that the awards program will encourage other individuals to emulate honorees by their dedication to safeguarding the lives and health of union construction workers. George Allen is the Co-Founder and Treasurer of Archer Corporation, a company known for providing quality interior construction services, with an emphasis on installation. Located in Malden, Archer Corporation is the largest company of its kind in the greater Boston area. Archer Corporation combines "new world" technology with "old world" craftsmanship working for some of the most prestigious owners in the area. Allen has overseen his company? ?s exemplary safety program for 40 years and holds several OSHA instructor certifications. But his resolute dedication to safety excellence does not end with Archer Corporation. As a trustee of the Boston Carpenters Apprenticeship & Training Fund (BCATF), he is an avid promoter of safety training programs for all Boston area carpenter apprentices and journeypersons and is responsible for implementing mandatory safety training for all BCATF apprentices. Allen has demonstrated his commitment to advancing excellence in the construction industry beyond safety and health through his active participation in other industry organizations as well. He serves as President of the Building Trades Employers Association, is a Director for the Associated Subcontractors of Massachusetts and a Trustee of the Massachusetts Construction Advancement Program, and is a former Director of the Massachusetts Building Congress. The Construction Institute (TCI) is a partnership comprised of building trades unions, union contractors, contractor associations, industry professionals, and 75,000 skilled union crafts men and women, dedicated to being the premier provider of construction services in Massachusetts. TCI promotes quality construction and a skilled construction workforce for the benefit of the Massachusetts construction industry, the local communities and the customers it serves.For additioanl information about all the award recipients click here.